Correct operation and maintenance of machinery ensures that work is completed properly without risk to those nearby. Conveying important safety messages on how to do this is essential and will form part of your health and safety risk assessment. We carry a range of machinery labels in our collection that cover hazard warning, prohibition and mandatory information. These can be placed on or around machinery so that everyone is aware of important safety instructions such as what personal protective equipment (PPE) to wear before use. For more information on machinery labels and how they can be used, check out our buying guide. Health and safety when working with machinery is of paramount importance. Very serious, life-changing accidents can occur as soon as rules, regulations and best working practices are not adhered to. As part of your risk assessment process the need for signs to impart vital safety information will have been identified. Workers can often become complacent, however, when working in the same environment on the same tasks day after day and a visual reminder of their responsibilities is a worthwhile investment. Machinery labels can be placed just about anywhere and will instantly provide valuable information around your worksite. Prohibition labels identify actions you must not take at certain times. It is essential to use such labels to ensure your employees are safe when operating, cleaning, maintaining and repairing machines. 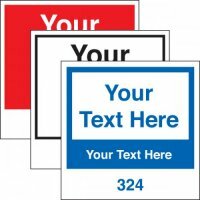 Labels of this type can be used alongside larger signs to reinforce their message and make sure it is placed as close to the items they refer to as possible. Identification labels point out important operational elements such as the location of emergency stop buttons or let staff know the status of a machine at any given time. This range also includes several different types of colour-coded indicator labels these can be used in a variety of situations, identifying, for instance, whether or not machinery has passed an inspection or is operational. Mandatory information labels convey instructions to your employees to ensure machinery is operated correctly and carefully, with the goal of accident prevention. They cover key instructions such as keep hands clear of rollers and use machine guards. These actions are all important in ensuring the safe operation of machinery, and the protection of the employees working with it. Our safety clothing labels let staff know when they should be using appropriate workwear. Labels can be placed directly on machinery and equipment so even if it is taken off-site workers will be aware of the requirements. Where machinery has a complex set of instructions that must be followed in order to guarantee safe operation, a label can be placed directly on to the equipment reminding operators to check manuals before they proceed. Hazard warning labels inform employees to be cautious in potentially dangerous situations. These labels should be placed on the machinery in appropriate positions to advise everyone of hazards and prevent misuse of machines and consequent accidents. Some display simple written warnings while others feature well-known symbols designed to alert your employees to risks as quickly as possible. In the event that you are unable to find the machinery labels you require for your workplace, you can also design your own customisable labels.